Last weekend began on Thursday night with a bottle of Champagne on a Manhattan terrace and ended with a bottle of 1990 Bordeaux in Sag Harbor on Sunday night. And there were some very nice wines in between. Made from 40% Pinot Noir, 40% Pinot Meunier and 20% Chardonnay, this was the perfect champagne to serve at a cocktail party: light, elegant, soft and crisp with a floral aroma. 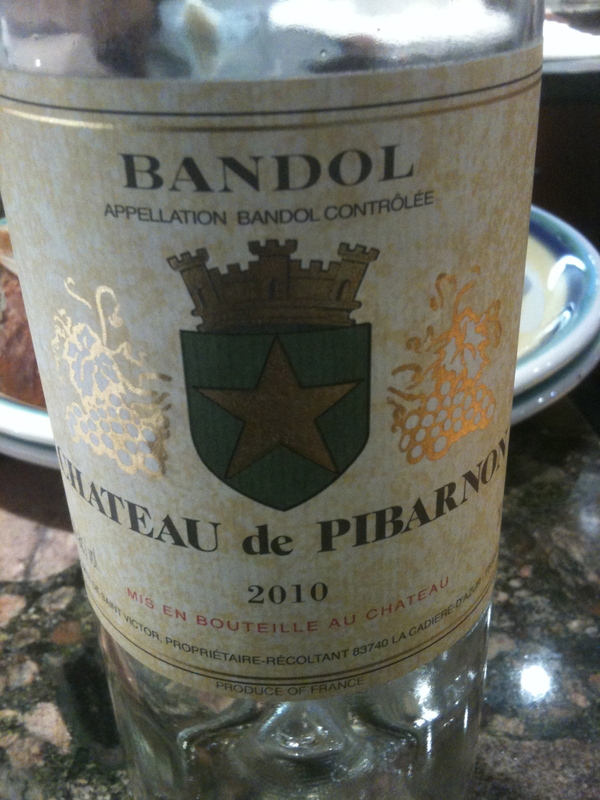 Bandol Rosè 2010 Chateau de Pibarnon made from 50% Mourvèdre and 50% Cinsault. The location of the vineyards is on Telegraph Hill where the terraced vineyards form a sort of amphitheater to protect it from the Mistral. The soil has large quantities of blue marl, and limestone, stones and rocks as well as fossil material, which make it unlike any other soil in the appellation. Traditional goblet (bush vines) training for the vines. After 30%/50% destemming, vinification takes place in stainless steel tanks. The wine is salmon in color with floral and white peach aromas and tastes of white peaches. This is one of the best rose´ wines that I have had in along time. Antinori. Made from 100% Sangiovese. The Pian della Vigna estate is located 3.5 miles to the south of the town of Montalcino. The soil is mostly clay and calcareous with many small stones. The grapes are softly pressed and the must has 15 to 21 days of skin contact in 125-hectoliter temperature controlled stainless steel tanks. The wine is aged in large oak casks for a period of more ten two years. Complete malolactic fermentation takes place in oak. 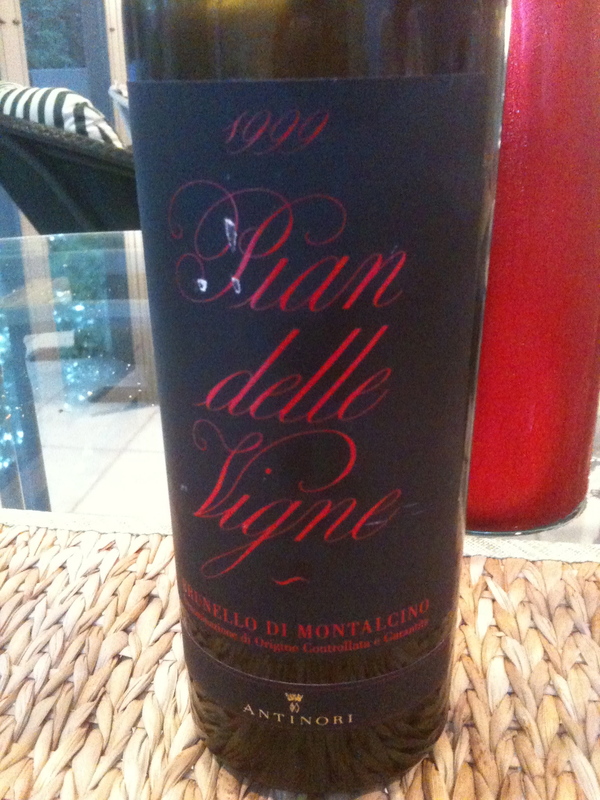 This is a big complex Brunello with red fruit aromas and flavors with hints of cherry, tobacco and a touch of spice. This wine will age for a number of years. 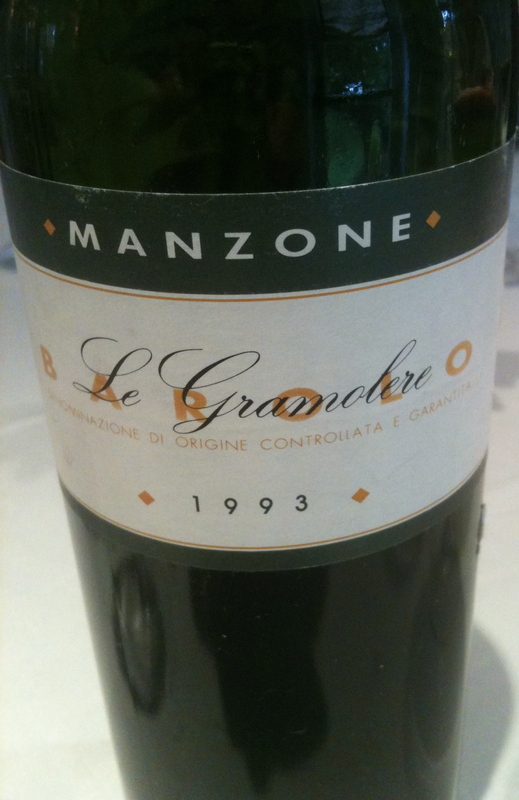 Barolo “Le Gramolere” DOCG 1993 G. Manzone made from 100% Nebbiolo. I visited the winery in November 2010 and met with the owner and wine maker Giovanni Manzone and his son Mauro. The winery is on the top of a hill called Le Gramolere overlooking the town of Monforte D’Alba. Giovanni said that they harvest the second week of October but in the past it was the first or second week of November. This is a very traditional winery. Maceration on the skins is for 15 days and the wine is aged in 25HL oak casks for 24 months and bottled 36 months after the harvest. This wine was drinking very nicely with red fruit aromas and flavors, hints of cherry and raspberry and a touch of spice and balsamic in the finish. 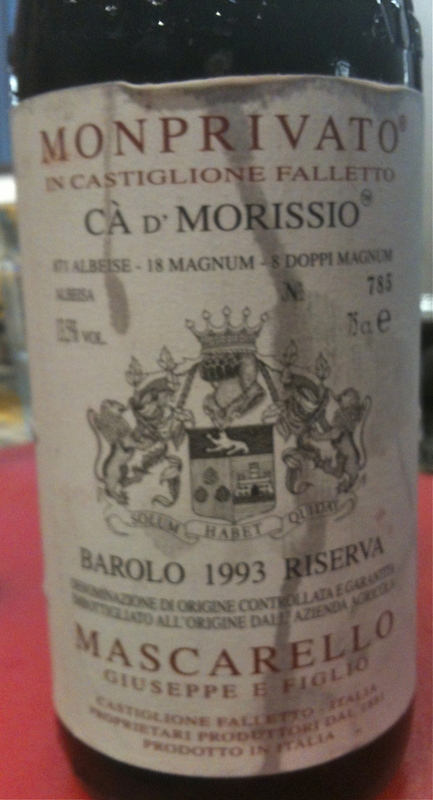 Barolo Riserva “Monprivato Ca’D’ Morissio” 1993 Made from 100% Nebbiolo. Giuseppe Mascarello The harvest takes place toward the middle of October but in 1993 it most likely took place in the beginning of November. Estate grown bunches are thinned during the summer. The wine undergoes traditional floating cap fermentation for 20/25 days. The wine is aged in medium size oak barrels for about 38 months. The wine is bottled four years after the vintage. This is a big classic Barolo with good rich red fruit and hints of leather, tobacco and spice. It will age for a number of years. The label indicates the number of bottles produced according to size. The 750 ml bottle is called an Albeisa* bottle. The label says Albeisa, Magnum and Double Magnum followed by the number of bottles produced for each. *The Albeisa bottle goes back to the beginning of the 18th century. Wine makers in the Alba district proud of their wine wanted a different shaped bottle to distinguish them from other wines in Piedmont. During the Napoleonic invasion the Albeisa was replaced by two typical French bottles — Bordeaux and Burgundy. Both were more uniform and cheaper to make. In 1973, 16 producers joined together and started using the Albeisa bottle again. The aim of the Albeisa association is to characterize and qualify oenology products of the Langhe and the Roero hills. Only wines with denominations within this area can be bottled in the Albesia bottle. 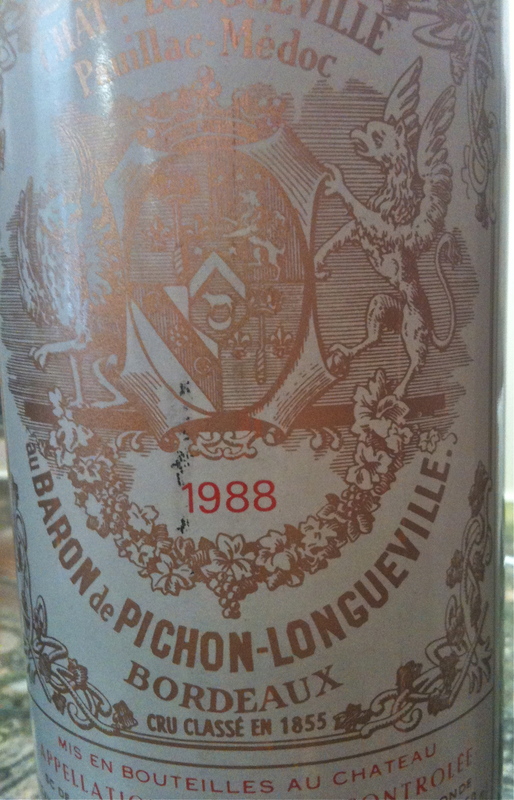 Baron de Pichon-Longueville 1988 (Pauillac) made from 82% Cabernet Sauvignon and 12 Merlot. Aged in 80% new barriques and 20% in barriques that are one year old. This wine was just starting to come around and can age for a few more years. 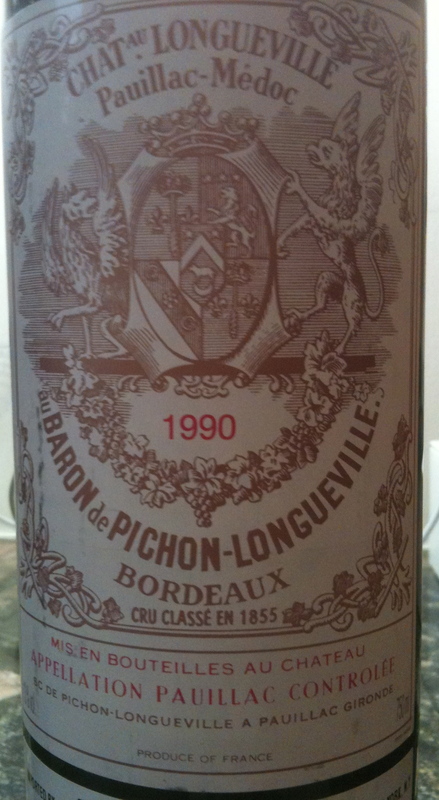 Baron de Pichon-Longueville 1990 (Pauillac) The1990 is a big wine that is not ready to drink. Both wines were served with grilled lamb and at this point in time the 1988 was the better wine with the lamb. For a wine to drink now I would buy the 1988 and for a wine to age, the 1990.